Sciency Thoughts: Identifying the cause of the 2016 Bangladesh Wheat Blast epidemic. Identifying the cause of the 2016 Bangladesh Wheat Blast epidemic. In February 2016 farmers in the west of Bangladesg began to report cases of a severe Blast Fungus infection in Wheat fields, which spread rapidly to eight districts, destroying up to 100% of the crop. This caused considerable alarm, as Wheat, an introduced crop that lacks any indigenous pathogens in South Asia, is now the second most widely grown cerial crop in Bangladesh (after Rice), and is also widely grown in several neighbouring states. 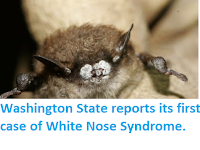 In a paper published in the journal BMC Biology on 3 October 2016, a group of scientists led by Tofazzal Islam of the Department of Biotechnology at the Bangabandhu Sheikh Mujibur Rahman Agricultural University describe the results of an intensive study aimed at determining the cause of this outbreak. Islam et al. 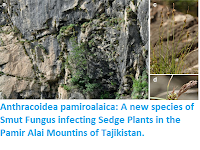 initially tried inoculating seedlings of a variety of wild and cultivated plants grown in the region in an attempt to assertain if the Fungal infection had jumped from another species. They found that a number of other plants could be infected in this way, but notably the Fungus did not infect Rice seedlings. This pointed strongly towards an infection by the Blast Fungus Magnaporthe oryzae, several different strains of which ate known, with strains that infect both Wheat and Rice and which will infect other plants under laboratory conditions, but no strains that can infect both main host species. Symptoms of blast disease in spikes, leaves, and seeds of wheat in a farmer’s field in Jhenaidah in Bangladesh, and a micrograph showing two conidia of Magnaporthe oryzae. (a) A completely bleached wheat spike with traces of gray from blast sporulation at the neck (arrow) of the spike. (b) Complete bleaching of a wheat spike above the point (arrow) of infection. (c) Two completely bleached spikes with traces of gray (upper arrow) and a lesion (lower arrow) from blast sporulation at the base. (d) Typical eye-shaped lesion (arrow) and dark gray spots on a severely diseased wheat leaf. (e) Mild blast disease-affected slightly shriveled wheat seeds. (f) Severe blast-affected shriveled and pale wheat seeds. (g) A severely infected rachis with dark gray blast sporulation at the neck (arrow) and severely damaged spikelets. (h) Micrograph of two conidia isolated from the infected spike of wheat. Scale bars in (e) and (f) are 1 cm and that in (h) is 10 μm. Islam et al. (2016). Armed with this information Islam et al. then sequenced the genome of the Blast Fungus and published their results on Open Wheat Blast, an open access archive of Wheat Blast genomes which allows experts around the world to compare the data on such outnreaks. 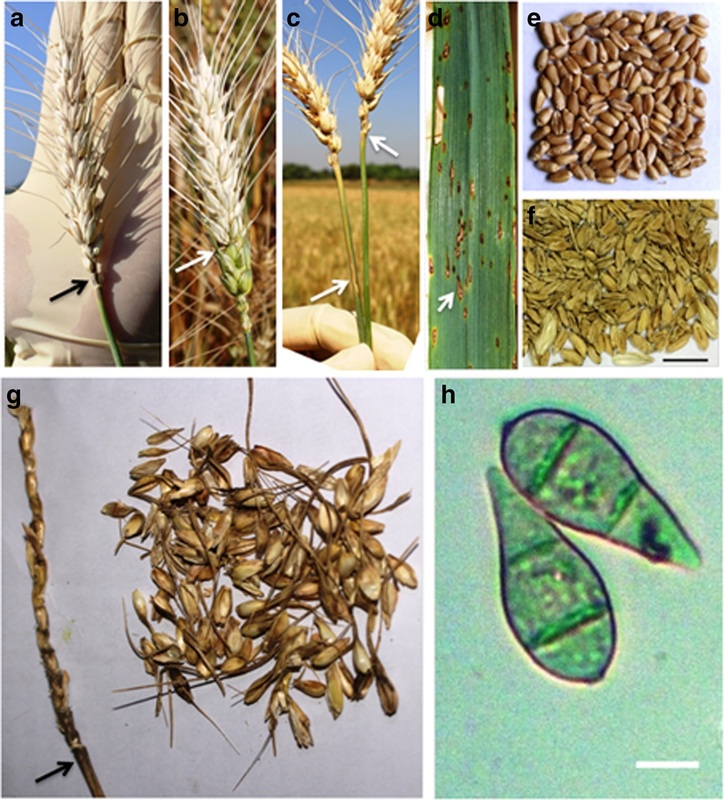 This revealed that the genome of the Banglsdeshi Wheat Blast was very close to those collected from outbreaks of Magnaporthe oryzae in Brazil over the past 25 years, strongly suggesting that the Bangladesh outbreak was caused by spores or infected Wheat brought to the country from South America.